If you want to login to your Gmail account or your Facebook account you need to enter your login details which include your username along with the password. If you are going to shop anything off the internet, then also you have to enter your password so that you are able to make the purchase. Now if you are using the internet for a while you might know that it is not safe to keep a single password for all websites. If you are having a lot of passwords for different websites, it might become extremely difficult for anyone to remember the password for all the websites. At this point, password manager software comes to play a vital role. You can use password manager for Windows PC to store all the information of different websites where you have registered. In today’s Windows guide, we are going to share the top 10 best free password manager for Windows which will help you in saving the passwords with you. Using password manager is one of the most ideal tricks to generate secure passwords, random passwords for you and remember all those passwords so you can easily use them when needed. The first password manager software which makes to our list is LastPass password manager. LastPass keeps all your details safe and allows you to access the passwords from anywhere. All the details which are stored in Lastpass password manager for Windows are encrypted which makes sure that the details are safe. 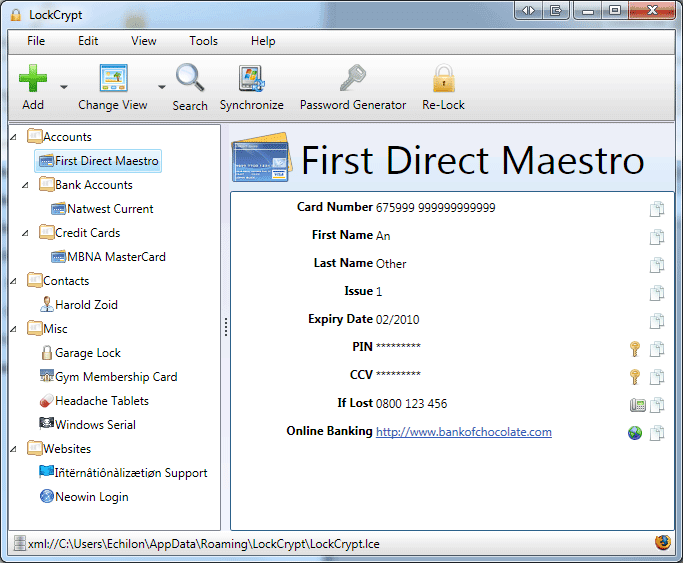 LockCrypt is a best free password manager for Windows. You can use LockCrypt to store all the important account information such as your credit card details, telephone numbers, and passwords for websites. Making third to our list is KeePass, a password manager software for windows. KeePass is an open source software where you can store all your passwords. The passwords which you store in KeePass are safe as you need to enter master key in order to access the database of passwords. To add more security, you can use the key file for accessing all the passwords stored. There are more than 1 million registered users of Password Safe. Password Safe is one of the most simple & secure password management services. Using this password manager, you can create a list of usernames and passwords and all the details stored in this password manager are encrypted. There is a choice to store passwords in single encryption list or in multiple databases. RoboForm free password manager is ideal for people who are having a lot of accounts on the internet. Roboform is not only best password manager software but is also one of the oldest password managers which you will ever come across. The software is available for free and uses encryption algorithms to keep details of the user safe. You also get a browser toolbar which allows you to store the login details easily. The next software which makes to our list of best free password manager is PasswordBox Premium. Using this password manager, you can import all the registration details of different websites and save them with you on your computer. The tool also has an automatic password capture feature which helps in saving the passwords automatically. You can use 1U Password Manager for free on your PC. The password manager is good and works well, however there are limited features which you will get in this software. The developers need to work on the user-interface of this password manager and make it more user-friendly. Norton is always known for the antivirus programs for PC. Norton has also developed a free password manager called Norton Identity Safe which helps in keeping all your passwords safe. You can easily add new passwords and view or delete the passwords which you have already stored in the database of Norton Identity Safe. If you are looking for a password manager with fancy features, WWPass is the software which you need to try. The password manager comes with two-factor authentication. All the data which you are planning to store on WWPass will be split into different servers which keep it secure from the attacks of hackers. The last password manager for Windows which makes to our list is KeePass (Classic Edition). Similar to KeePass password safe, KeePass (Classic Edition) is also a best open source password manager which is ideal for all the IT experts and professionals. If you are shifting from any other password manager, you can easily migrate all the data which was stored in your old password manager. So these are then top 10 best free password manager software for Window. Please share it with us using the comments section below – which password manager software for Windows are you using to keep your passwords and details safe?